To end up with an effective microphone that ultimately makes you sound good (and isn’t that what we all want!? ), you don’t have to spend a fortune. In fact, a condenser mic under $200 will usually deliver awesome results – especially if you end up with Audio-Technica’s AT2035. It may not knock you down with its design, but it remains one of the most capable mics in this price range today. Let’s take a closer look. When it comes to design, Audio-Technica uses the ‘if it ain’t broke, don’t fix it’ line of thought, and this mic looks very similar to its lower-priced brother the AT2020. From a purely aesthetic point of view this is no bad thing. With a completely black finish and a sturdy metal chassis, this mic looks very sophisticated and feels like a quality piece of equipment, which is more than you can ask for in this affordable price range. With a total diameter of 2.1”, it is a sleek and simple microphone that has been designed and engineered to get the job done. Audio-Technica hasn’t packed the AT2035 with features or accessories – instead the idea was to deliver rock-solid hardware that resulted in an equally solid core performance. What you do get in terms of features is a large diaphragm and a single cardioid polar pattern. It comes fitted with an 80Hz high-pass filter and the much requested 10dB pad, while it is shipped with a decent custom shock mount and a stylish black leatherette pouch. What about the specs? Things are pretty standard in this price range, with a 20Hz to 20kHz frequency response range and a sizable SPL max of 148dB. As for connections, the AT2035 is fitted with a standard XLR connection, as you’d expect. Not bad at all. Performance-wise, the AT2035 has a very impressive core performance, with the -10dB pad and high-pass filter making a great difference. As small as it may sound, these two features alone extend the practical value of the microphone by a considerable margin, especially when you take its price into consideration. Vocal reproduction is every bit as good as we would expect for a sub-$200 mic, with warmth and clarity, and a nice midrange sparkle. Recording instruments with this mic is also made much easier thanks to the attenuation feature. By flipping that switch, you can push a much higher SPL into the mic, allowing you to record instruments at a higher volume. Audio-Technica, consider us impressed. The AT2035 proves that the small things can combine to make a very powerful piece of equipment, and this mic is a definite step up in sound quality compared to the lower-priced AT2020. Providing you can afford the step up in price, it would make an excellent first mic for any ambitious vocalist or producer. For more info about the Audio-Technica AT2035, click here. 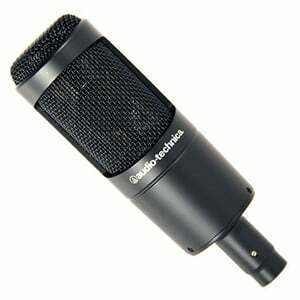 For more Condenser Microphone Under $200 you might like, click here.